La Parroquia De La Purisima by Bruce Nutting - 10.000" x 6.250"
La Parroquia De La Purisima framed print by Bruce Nutting. Bring your print to life with hundreds of different frame and mat combinations. Our framed prints are assembled, packaged, and shipped by our expert framing staff and delivered "ready to hang" with pre-attached hanging wire, mounting hooks, and nails. PS. If you have any photographs of other interesting sites in Turre, that would you think would be worthy of painting, I would love it if you would get in contact with me. My email address is nuttinb@hotmail.com. 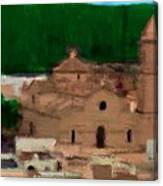 I spent 5 years in the town of Ecija and a couple of years in Caceres. I love Spain and miss it so very much. Thank you very much Assisi. I did confuse the two. I will change the title. I appreciate you clarifying this for me and all the views. Un Abrazo y Bendiciones. 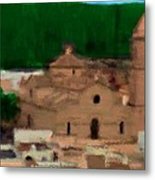 This is a painting of a small chapel called Ermita de San Francisco in a small pueblo (village or town) called Turre. It is about 60 kilometers north of Almeria in Andaluc�a. I used a Degas brush stroke for most of the buildings and a van Gohn brush stroke for all the greenery. To pulled the colors together and to fix any small "spaced" in the painting I used a small Monet brush stroke.